This is a child-sized version of the Ribbed Beanie Hat. Essentially, the pattern was easy to make since all I did was calculate the number of Rows and stitches portioned to the adult-sized Ribbed Beanie Hat pattern. The hart can be made and combination of colors. 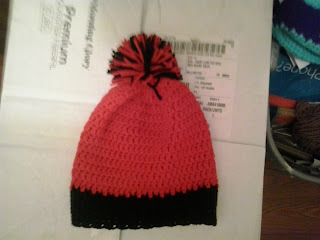 The hat ordered by my co-worked was made with black and red. Finish off leaving a long tail. Weave tail through sc of Rd 13, pull tightly and secure. Weave in ends. I throw this option here because a pom-pom on top of the hat would conceal the closing of the hat. My co-worker did not want the pom-pom option on her hat. The size of the pom-pom is up to the person making the hat.